Inspired by the Tiffany Ascension stained glass window at Grace-St. Luke's Church in Memphis, TN. Commissioned by the Belvedere Chamber Music Festival. Commissioned by saxophonist Connie Frigo for the 2007 Saxophone and Percussion Project at the University of Tennessee. The piece is programmatic of water's transformations in the environment: evaporation, condensation, precipitation, flowing in streams and rivers, and collecting in water tables and oceans. This piece incorporates two Appalachian traditional tunes ("Queen of the Earth and Child of the Sky" and "Falls of Richmond") as played by the famous West Virginian fiddler Edden Hammons. The work's title is taken from Edden's fear of playing at dances after midnight on Saturdays. One time he did this and he saw a mysterious red streak stretch across the sky. This piece was composed for my colleagues at Sewanee, Junko Oba, koto and Katie Lehman, violin. Regarding the title, I'll just say that I was pleased to discover that when you forget the bridges for the koto you're borrowing, bottles of white-out work pretty well! This piece is based on Marin Marais' viola da gamba composition Le Labyrinthe (1717). Additional inspiration came from Louis XIV's garden maze at Versailles. (Here are some images of this maze.) My idea was to create a piece that evoked the surreal idea of being lost in Marais' tonally adventurous work. Text by poet Gail Golden. Labyrinth programmatically portrays the myth of Theseus� encounter with the Minotaur in the labyrinth. The first section depicts the thread and love of Ariadne, both of which she offers to Theseus. The following music suggests Theseus' physical and psychological disorientation as he journeys through the labyrinth. While playing this section, the saxophonist may opt to walk a labyrinthian pattern on stage. Once in the center, Theseus encounters and slays the Minotaur (III). In the final section, Theseus' Return, the hero's recession out of the labyrinth is musically portrayed by a retrograde of the first section. The music structurally reflects graphic characteristics of a medieval floor maze found in the San Vitale church in Ravenna. Labyrinth has received many performances including one at the Logos Foundation in Belgium. Here is also an interesting labyrinth website. Score currently published by Dorn Publications. This work was composed for the dance production of Art Moves (see below) and was inspired by a found-object sculpture by Bessie Harvey (1929-1994). Moses is portrayed by a long stick that mysteriously towers over the viewer. Another curved stick is perched on top to suggest the serpent. The music is based on the spiritual "Go Down Moses." A gryllus is a type of grotesque that appears in medieval marginalia. It is a mischievious-looking figure with no arms or torso. Click here to see one (the gryllus is on the right). This work is based on Johannes Ciconia's puzzle canon Le ray au soleyl (c. 1390). This piece is a wild ride! 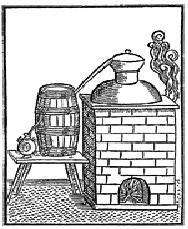 A stream-of-consciousness voice processes the day's news, a 17th-century alchemist reveals his secrets at a cocktail party and the string quartet provides a most unusual soundtrack. Score available through AMC. Hocket was also reviewed in Percussive Notes. This piece takes its inspiration from the stratified texture of medieval Petronian motets in which each voice corresponds to a particular rhythmic activity (i.e. the low voice moves slowly, higher voices more quickly). In my piece, the rhythms correspond to register rather than to specific voices. So, for example, the rhythms of each voice become faster as it moves higher. The first section explores this schema, the second is a free senza misura section, and the third turns the relationships of the first section upsidedown. This audio excerpt is of the end of the first section moving into the senza misura section. Commissioned by the University of the South Choir and premiered at the 2008 Sewanee Festival of Lesson and Carols, Robert Delcamp, conducting. Gail and I collaborated on this piece in response to the events and aftermath of September 11. To read Gail's beautiful poem and learn more about her, click here. 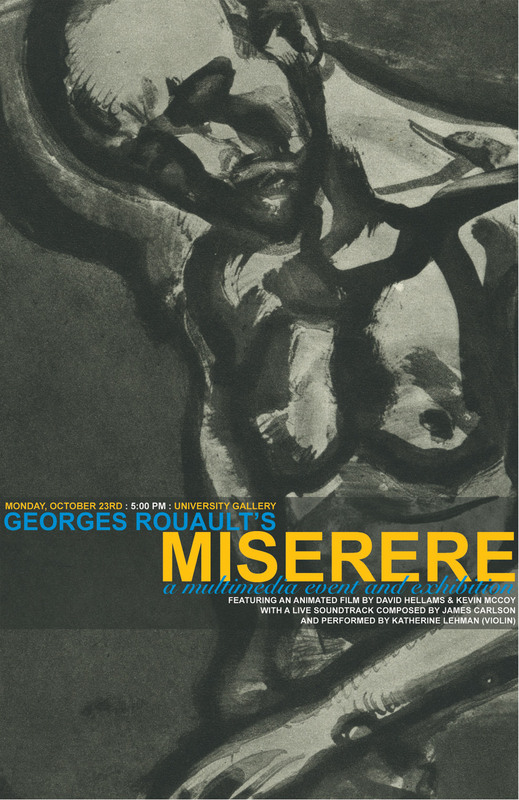 Premiered by the Knoxville Symphony Orchestra and Choral Society, Lucas Richman, conducting. This festive piece pairs the Hodie text with the English carol "Jesu, As Thou Art My Savior." This piece was composed for the Sewanee University Choir and premiered at its 2006 Festival of Lessons of Carols. Text is from a 15th c. English carol. Text is "Song" by Christina Rosetti. That is the Magic (2005) for SATB chorus and piano. This lyrical 4-movement chamber cantata is based on poems by James Agee and explores themes of earthly and divine love, ranging from cynicism to blissful transcendence. Commissioned by the TVUU Church Performing Arts & Lecture Series and premiered by Kevin Anderson, tenor, Jami Rogers, soprano, and the Harmonia Vocal Quartet. Text is in English and setting is suitable for Episcopalian liturgical use. This piece is tonal and plays up the dramatic element of Carroll's charmingly twisted little poem. in which centered texts are surrounded by often bizarre marginalia. Check out some facsimiles of 13th & 14th c. manuscripts at the Bodleian Library. View a few excerpts from the score. Commissioned by the Knoxville Symphony Orchestra and premiered June 13 in Cades Cove, Smoky Mountains National Park. Texts by Jenny Bennett. Jenny Bennett's blog about the premier. This piece is based on the well-known 12th-century organum quadruplum by Perotin, Omnes Viderunt. The style of this medieval vocal work consists of a chant melody sung in long sustained notes with four other voices dancing rhythmically above. The upper four voices all sound within the same register so that many "ringing" dissonances occur. I've always felt that this striking texture easily evokes the contemplation of the infinite. The effect is similar to gazing up at the dizzying vaults of a medieval cathedral and one of my goals in this orchestral piece is to capture the awesome sense of verticality of gothic architecture. Inspired by the fact that Perotin composed the first known examples of four-part writing in western European music, I imagined an orchestral organum in which the process of adding voices could be taken further. Various elements of Omnes Viderunt appear in my work and, throughout the piece, there are many symmetries that reflect the theme of infinity. 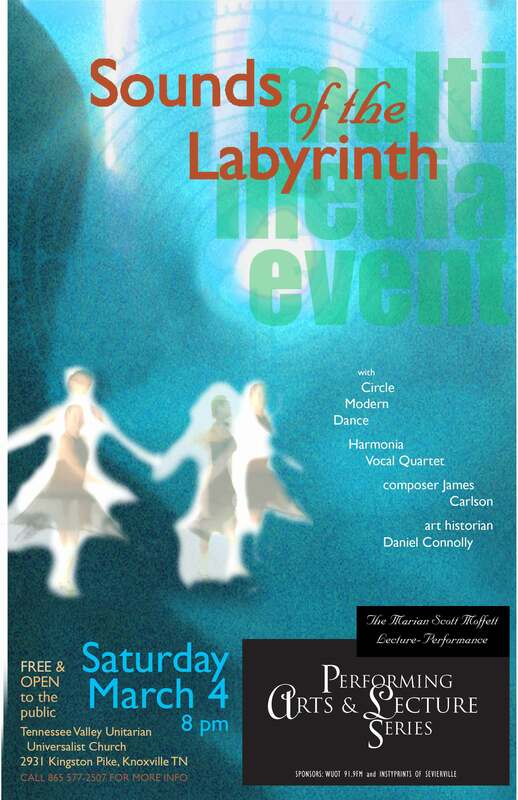 SOUNDS OF THE LABYRINTH (2006) was an interdisciplinary program that I organized for PALS that surveyed the history of labyrinths in music, dance and visual media, and featured a lecture by art historian Daniel Connolly and performances by Circle Modern Dance, Harmonia Vocal Quartet, soprano Lori Smithey and other talented Knoxville musicians. The musical program included my Dans le Labyrinthe de Marais and Victime Paschali Laudes. (See above.) Other musical labyrinths on the program included the "Gloria" from Josquin Desprez's L'homme arm� mass, an aria from G.F. Handel's Arianna in Creta, J.S. Bach's Eine kleine harmonische Labyrinth, Marin Marais' Le Labyrinthe and Donna Kelly Eastman's Virginia Labyrinth. The Marais piece was choreographed by Angela Hill and accompanied by a media piece by Martha Shepp. Performances during this event were presented on a canvas floor labyrinth. 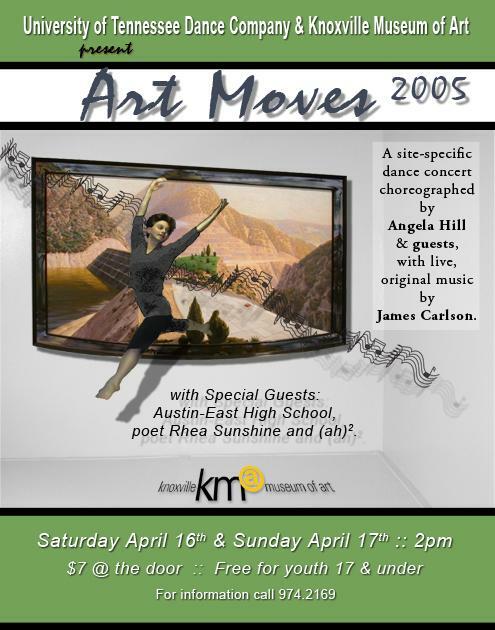 ART MOVES (2005), University of Tennessee Dance Company, Angela Hill, choreographer. 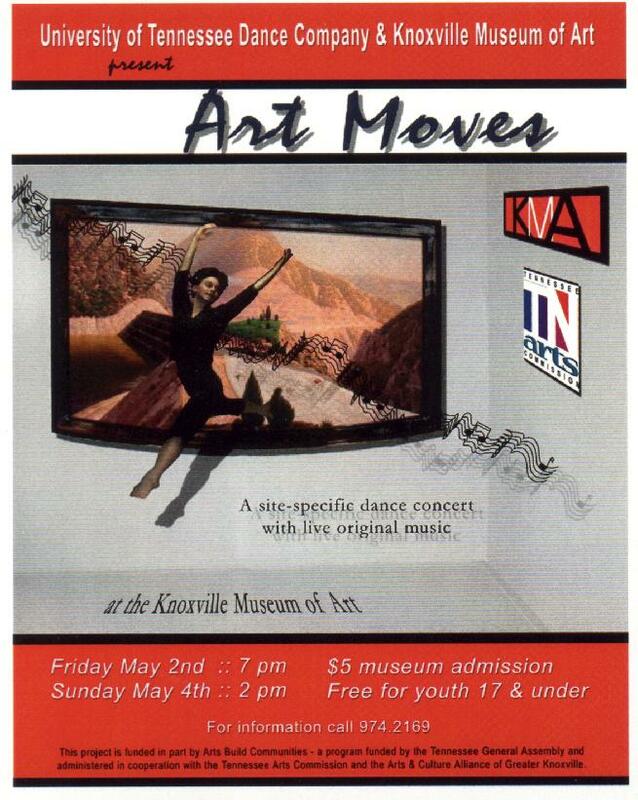 This show was our second onsite dance production at the Knoxville Museum of Art. This event premiered in 2003 (see below). In 2005 we added the following elements: an interactive sculpture that allowed audience members to control sound using motion sensors, poetry read by Reah Sunshine, and a "gallery walk" in which audience members strolled through an exhibit while improvising dancers and musicians interpreted works of art. Dance works were based on paintings from the KMA permanent collection and the Knoxville-born artist Beauford Delaney exhibit. The Knoxville Metropulse hailed the production as "Brilliant, progressive and wholly eventive." Click here to read entire review. ART MOVES (2003), University of Tennessee Dance Company, Angela Hill, choreographer. This show was an onsite dance production at the Knoxville Museum of Art. Each of the dance works is based on a painting or sculpture on display at the museum. Music is scored for various combinations of flute, alto saxophone, cello & percussion. and African American cultures and issues surrounding racism & bias. Music co-composed with African drummer Beverly Botsford. Contents Under Pressure was reviewed in the Raleigh News & Observer. 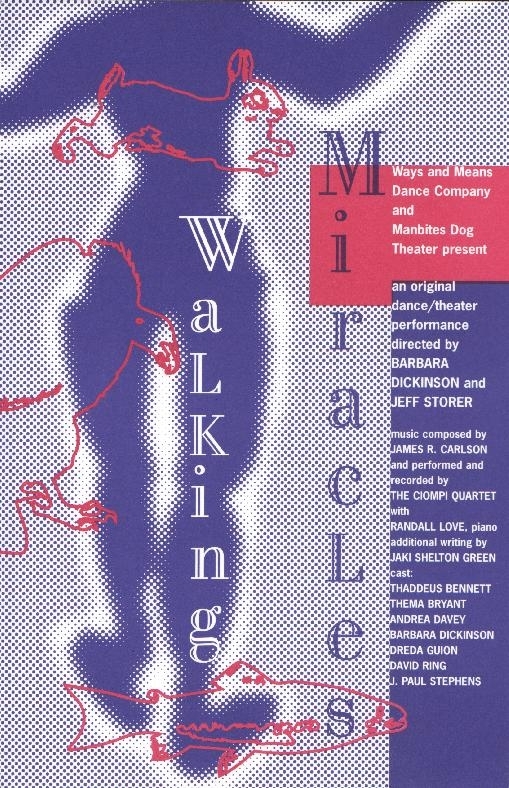 WALKING MIRACLES (1997), a dance/theater production dealing with issues of childhood sexual abuse. For more info, see my Bio. Walking Miracles received favorable reviews. A film version of this show by The Groove Productions won an Honorable Mention at the 48th Annual Columbus International Film and Video Festival and is available to purchase on DVD at the Sidran Institute website. Unless otherwise noted, James Carlson's works are published by Alembick Music (ASCAP). For scores, parts, recordings and more information about any of these works contact the composer at the e-mail address below.